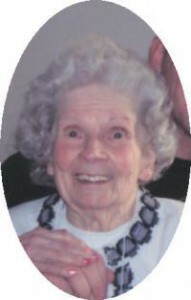 Leone E. Arveson, 97, died November 11, 2010 at her Harbor Club Residence. She was born November 16, 1912 in Milwaukee, Wisconsin to Leander and Martha Strutz Johnson. She grew up in Milwaukee and lived there for many years. She married Daniel J. Mertens of Manitowoc in 1932. He preceded her in death in October, 1951. In June of 1953 she married Ardin J. Arveson of Wautoma. He preceded her in death August 20, 1995. She was a bookkeeper for many years at the former Wieman’s Variety Store in Milwaukee. In the 1960’s Leone moved to Mequon and then to West Bend in the 1980’s. In 2001 she moved to the Harbor Village in Port Washington and then in 2008 she moved to the Harbor Club and enjoyed living there immensely. She enjoyed playing BINGO and making crafts, was a great cook and loved chocolate. She is survived by her daughter Patricia “Pat” (Thomas) Maley of Belgium, grandchildren Colleen (Patrick) Jentges, Michael Maley, Brian Maley, Lynn (Randy) DeHate, Beth Ann (Peter) Schultz, Daniel (Shawna) Maley, Kevin Wolfgram, Gary Wolfgram, Shannon (Curt) Shaurette and Timothy (Vicky Stathos) Maley. Further survived by 15 great grandchildren, 1 great great grandson, sister Vivian Dentinger of Minocqua, WI, nieces, nephews, other relatives and friends. Preceded by her two husbands, sisters Irene Mathis, Florence Stroede and Mabel Monsler, brothers Armine Johnson, Chester Johnson and Myron Johnson and grandson Dale Wolfgram.